Celebrity chefs Luke Mangan and Maggie Beer have jointly created Hilton Sydney’s new Winter Menu. 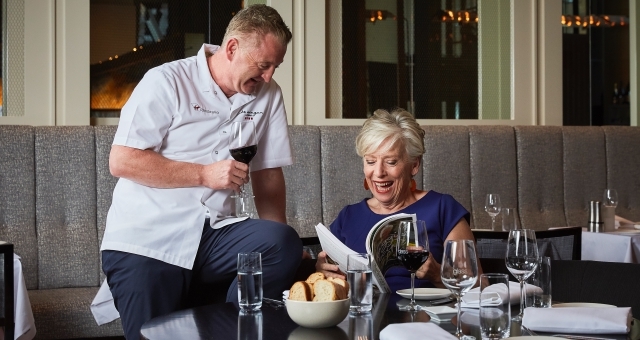 Sydney’s Hilton Hotel has rolled out a new winter lunch menu at Luke Mangan’s glass brasserie, featuring dishes curated by fellow celebrity chef Maggie Beer. Sitting prominently on glass’ $29 Wine Bar lunch menu will be a variety of seasonal dishes put together with fresh produce from Mangan’s and Beer’s respective native states of NSW and South Australia. Signatures on the selection will be Mustard pear stuffed chicken breast with crushed parsnip and jus, featuring pears from Beer’s own Barossa orchard. The dessert menu will offer other Beer delicacies including Verjuice custards with bergamot-braised raisin clusters. Designed as an affordable yet high-quality “power lunch”, the glass menu is aimed at busy city workers looking for a memorable experience mixed with efficient service. “Being able to work alongside Luke and his team at one of Sydney’s notable restaurants is a real privilege. I am extremely passionate about local produce, so I’m thrilled to be able to bring a bit of the Barossa with me as part of this collaboration. My only hope is that Sydney gets as much joy out of eating these dishes as I did in making them,” Chef Beer commented. The $29 Wine Bar lunch menu is available weekdays until 31 August from midday to 2pm and includes a complimentary glass of wine. Table reservations can be made online by visiting www.glassbrasserie.com.au.